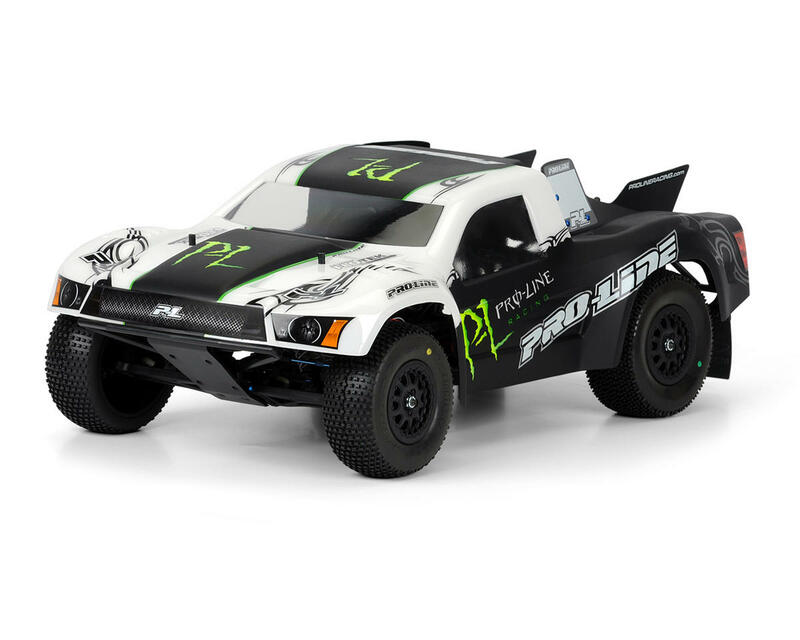 This is the Pro-Line Flo-Tek Body, and is intended for use with the Traxxas Slash, Slash 4X4, Associated SC10, Kyosho Ultima SC and HPI Blitz short course trucks. Introducing the first SC body specifically designed to minimize the short-course body parachute effect! If you have ever raced or bashed a short-course truck, you know that SC bodies act like parachutes when going over jumps, causing you to lose control and crash. 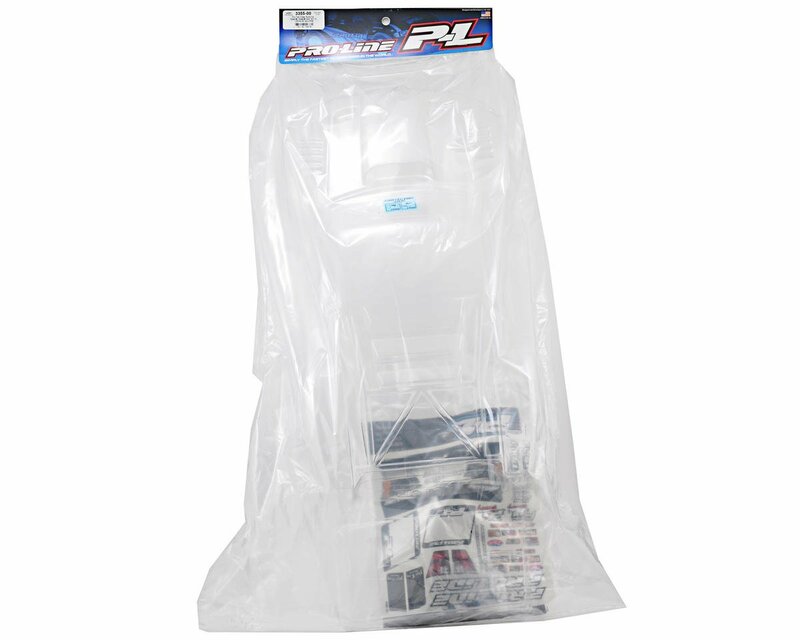 Pro-Line’s new Flo-Tek SC body features futuristic styling coupled with large vent holes that allow air to flow through – eliminating aerodynamic drag. The locations and size of the vents were designed to maximize air flow through the body while keeping the aggressive and high-tech look. This is a good body for Short Course Truck Racing but one thing is that it doesnt fit on to a Slash properly and you need to take off the side nerf bars to make it look ok since you can see the doors have points sticking out from the bars and my best tip is to drill the holes first before you paint it so you know it will fit onto your sct chassis ok! Body fits very well on a Losi SCTE. Don't go by the marks on the body for where to drill for the body posts. The marks are not correct. 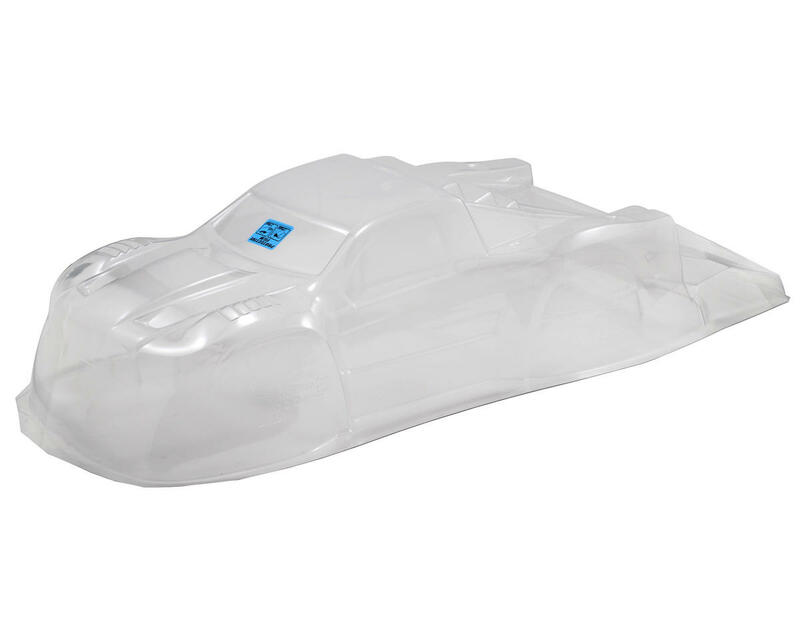 The body has been more durable than expected but it helps to reinforce around the front fenders and across the body in front of the windshield with shoo goo and fiberglass tape since those are the first places it will crack. This has become my go to body. Purchased for my slash, it does not fit well on the slash at all. I did notice a difference at the track but for durability, you should also get some shoe goo ... your gonna need it. Its a good bashing body tho. This is a real nice looking body! If you have a Dremel tool its pretty easy to cut out all the air vents. I ran it without the vents cut for a few runs and it worked good, then I cut all the vents out and now it runs REALLY good! Stays nice and level in flight. The body holds up pretty good, Im ruff on mine and have had only a few cracks show up, but that will happen with any body after a few hard crashes. I like the body, very cool looking. Took a lot of trimming to do the air vents, but it does help with the parachuting effect. I was a little disappointed when it cracked along the back fenders. I thought it would crack where I had cut the vents but those held up great. Probably not the best for bashing or hard hits. I got this for my Kyosho Ultima SC and it will not work with my setup. I am not running the stock wheels. I am running the Blitz/Slash wheels which have a slightly different offset (making the wheels stick out from the vehicle an extra 2.5 mm on each side - which is not much at all). The Flo-Tek body does not clear the wheels (not even close on mine). Also the Kyosho chassis seems a little long for this body and the wheel well don't line up very well. Finally, do not be fooled by the markings on the body for Kyosho. Make sure you mark your own holes and don't trust the ones proline has marked just in case. I did appreciate how they made a little Key on the wheel well cut outs that explains what hole to use for each vehicle - its really clever, but unfortunately, it was not correct on my Ultima SC. If you must get this body, trim it, drill the body mount holes and fit it to make sure it work before you go through the trouble of painting.